Femme fatale, martyr, or tragic romantic heroine? 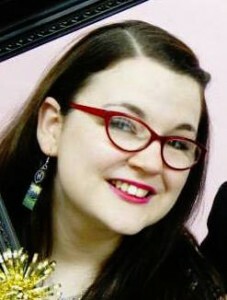 Lucy R. Hinnie is a part-time PhD student at the University of Edinburgh. Her research focuses on the discourse of legitimised desire, female representation and secular love in the late medieval and early modern period. Her PhD examines the Scottish response to the medieval querelle des femmes, specifically in verse miscellanies such as the sixteenth-century Maitland Quarto and Bannatyne Manuscript. She is an assistant editor on the Journal of the Northern Renaissance and a member of the Society for Medieval Feminist Scholarship. She currently lives in Glasgow and is no longer required to wear a kilt for work. In my time as an undergraduate, like many of my peers, I took on part-time work. In Edinburgh, the festival city, the opportunities were plentiful, but rather than bar work or ticket-touting, I spent a large part of my time pointing tourists in the direction of some ‘blood-stained’ wooden floorboards in a small, somewhat cramped room, off the Royal Mile. Rather than profiting from a poor flat-share situation, I was in fact working at the Palace of Holyroodhouse, where the legend and mythology of Mary Queen of Scots drew tens of thousands of visitors annually from across the world. I became blasé, as one does, to the rich history of the chambers in which I worked: the brutal stabbing of Mary’s secretary, David Rizzio in 1566 became an anecdote as banal to me as the constant remarks about the dismal Scottish weather, and the dazzling Darnley Jewel a trinket as unremarkable as the ubiquitous kilt and name badge that I wore. Yet as my studies in Older Scottish Literature progressed, and ironically, as my time at that job drew to a close, I found myself drawn back into the allure of Mary Stuart, and what she has come to embody in the public consciousness. The salient facts of her life are oft-mythologised and widely known: brought up in France, Mary came to Scotland as a young woman in 1561 arriving at the Port of Leith under a shroud of scandal, her first husband already deceased and her Catholic faith a source of great discomfit to a Scottish court on the brink of Reformation. Her ill-fated marriages to Lord Darnley and the Earl of Bothwell are well-documented and the source of much salubrious speculation, rife with blood and betrayals. Moreover, the relationship between Mary and her cousin, Elizabeth the First of England, is woven into popular history with a reverence reserved for the bitterest of conflicts, concluding with the public execution of Mary at Fotheringay Castle in 1587. These events are frequently referenced and dramatized and the longevity of Mary’s appeal is remarkable in its trajectory: over 400 years have passed since her execution yet the figure of Mary looms large in common perceptions of Scotland’s history. Perhaps the most interesting aspect of Mary’s categorisation as a ‘dangerous woman’ is the fact that the threat she posed, and the danger she embodied, manifested in multiple and often intertwined ways. Certainly the threat her Catholic faith posed to the growing Reformation movement in Scotland was evident, and well established in her tempestuous relationship with John Knox; while her claim to both the Scottish and English throne provoked questions of uneasy union that transcended any concerns over her gender. What has become clear to me over the course of my studies and my focus on women’s voices are the ways in which Mary’s ‘danger’ becomes writ large in terms that are liminal, universal and problematic to this day. Where popular depiction of Elizabeth is of a virago, hardened and attuned to the realpolitik of the patriarchy around her, Mary is seen as something of a femme fatale. Where Elizabeth remains immune to seduction, Mary’s personal life is the source of constant scrutiny and criticism of her character, as well as the fodder for a romanticised legacy that pervades to this day. The authorship of the casket letters remains an area of contention. What can be drawn from the incident, irrespective of their origin, is the delight with which those who stood against the queen adopted the idea of Mary as a lustful and adulterous woman, embodied in the rich yearning of the poetry. The truly ‘dangerous’ aspect of her character lay in her desires, expressed with poetic abandon on the page and ostensibly culminating in political turmoil such as Darnley’s demise at Kirk O’Field. These papers were not the ultimate downfall of Mary: this lay in the construction of a much bigger deception, facilitated in part by the enthusiasm and passion of a young man named Anthony Babington. Mary lived much of her life in captivity at various locations throughout England. Though her imprisonment had generally been in favourable conditions, in January 1585 Mary’s captivity took a turn for the worse in Chartley Hall, Staffordshire. Her new keeper was Sir Amyas Paulet, a strict Puritan who was unmoved by the charms of the imprisoned monarch. Her living conditions were severely restricted. Denied the freedoms she had been accustomed to, such as regular walks outside, contact with the general public and the pursuit of her charitable interests, Mary was further cowed as her access to correspondence was completely curtailed. She was no longer able to send or receive letters, and those that she did receive were to be examined by Paulet. This machination was a prescient move on the part of Elizabeth’s principal secretary, Sir Francis Walsingham, whose close relationship with Paulet allowed him to fully facilitate the eventual entrapment of Mary. Walsingham desired to prove the danger posed by Mary to Elizabeth’s life and throne, and working closely with a double agent, Gilbert Gifford, he succesfully catalysed the production of the evidence he so dearly sought. To Mary’s delight, one year after the initial confiscation of her correspondence, a benevolent brewer provided her with a means to contact the outside world. Securing his beer barrels with a leather bung into which letters could be hidden, this messenger allowed Mary to not only catch up on what she had missed over the previous year, but to forge new alliances and further her political plotting. One of the contacts she made over this period was young Anthony Babington. Babington acted on behalf of a group of enthusiastic and idealistic English Catholics, who desired the deposition of Elizabeth through assassination and the liberation of Mary. In a fervent and impassioned exchange, Babington revealed this plot to Mary and by August 1586 Mary eagerly awaited her escape. Unbeknownst to them both, a more sinister force was at work: the letters which they laboriously encoded and relied so heavily upon for the furtherance of their endeavours were in fact being intercepted by none other than Walsingham. With the help of the brewer and cryptographer Thomas Phelippes, Walsingham was able to read, analyse and record the contents of each missive, before passing it on to its intended recipient. Royal signature: letters were at the centre of Mary’s downfall, intercepted in a 16th century game of plots and espionage. The characterization of Mary as a dangerous woman, a threat to Elizabeth’s reign and life, was crucial in Walsingham’s plot and how he conveyed the evidence to Elizabeth. Perhaps unimpressed with the lack of enthusiasm in Mary’s response to Babington, Walsingham did not hesitate to further fabricate the evidence he had secured: he added a postscript to Mary’s letter requesting clarification of the identity of the proposed assassins and added some flourishes to the text to enhance the implication of guilt and danger. The Babington Plot was unmasked and resulted in the gruesome execution of its conspirators in 1586 and the eventual beheading of Mary the following February. Ironically, though the immediate threat to stability was removed, the legacy of Mary was not only as a martyr but as a tragic romantic heroine. The dangers embodied by Mary are reflected in the way in which society worked to remove her power and agency: the determination of male figures to render her powerless and assert their dominance is an integral part of her story, by no means unique to her enemies, given her tumultuous relationships with her husbands. Though the greatest conflict was ultimately embodied by the figures of Mary and Elizabeth, the brutal actions of political figures such as Walsingham show the unique provocation of a singular and distinctive female danger. To be a dangerous woman, for Mary, was to play a dangerous and ultimately fateful game. Antonia Fraser, Mary Queen of Scots (London: Weidenfeld and Nicolson, 1969), p. 500. Sonnet 2 The Mercat Anthology of Early Scottish Literature 1375-1707, ed. by R.D.S. Jack and P.A.T. Rozendaal (Edinburgh: Mercat Press, 1997), l. 11–14.